While not being totally commited to the cause..you know, the online fabric diet thingy (technical term! )...on a more personal level, I have actually been really concentrating lately on using what fabrics I have here at home. Truely, it's the most sensible thing to do, the most economic, not giving into consumer culture, etc. And, to quote Kristel @ http://wipgirl.wordpress.com/ ..."I have too much stuff. I have too much fabric. I have too many projects in progress. I have too many future projects" (unquote) !! So for my last 3 projects, I have been quietly fabric fasting, i.e. I have duly gone thru' the baskets hunting for bits & pieces, making adjustments, not getting distracted by newer fabrics, hey...it's what patchwork is all about, yes? But, to be honest, I was never any good at dieting! (and I couldn't ignore the current exchange rate any longer!) (and there are always some gaps in one's personal stash). Last week I went shopping. And yesterday the postie delivered! A couple of basics... Oval Elements in chocolate & a yummy eggplant. A few pretty pastel /low volume prints, always handy to have, yes? Some more AMH... I only had a small scrap left of this lovely deep purple, and am certainly going to need more for my BOM "Classic meets Modern". And then 2 "vintagey" looking fabrics, Carnaby Street Black Tea (just love the name!) and Lavender Dainty Daisies. I don't know about you, but getting time to sew has been a bit difficult lately. From a sewing point of view, I now have quite a list of "things-to-finish" at the moment! I did finish the quilt for Baby Caleb & it's gone off with little Olive to give to his mum today. And, I am in the middle of putting together a few more blocks for Alison over @ http://littleislandquilting.blogspot.co.nz/ ... the 'Giving Back - Soy Amado' project. I added borders onto 4 of the blocks to bring them up to the required size of 12 1/2" and then did some simple straight line quilting. These four are all ready now for posting off Monday morning! I actually love all this juggling.... you know, having a few different things all on the go at once, all at different stages! My theory is that I can focus on what ever I choose depending on time available, & my mood of course! And then there's the inevitable sewing "bucket list" too! But the really frustrating part is not having enough time to do it all ! Never mind... a little bit of fabric therapy today, and at least I was able to cross a couple more things off the "things-to- finish list"! Linking up with Lee @ Freshly Pieced, WIP Wednesday. And, linking up with Fabric Frenzy Friday for the first time over @ http://fortworthfabricstudio.blogspot.co.nz/ later on. This is a link up where anything goes!! anything to do with fabric that is! Having a small design wall has been v. useful to help make choices. Recently I put together a small collage of fabric scraps & just popped them up on the wall to look at. I had a bit of a colour receipe in mind -peach & creams & teal, plus just a small hint of purple to create impact. I really wanted to use up some of my scraps of AMH fabrics and I added in a few low volume fabrics too. It all seemed to work well...at least up on the design wall anyway! And so, this past few weeks I have enjoyed just simply looking at these fabrics on the wall. Just waiting for a reason to use them !!! But, you know, ultimately, it's do or die!....and it is only a small design wall after all! 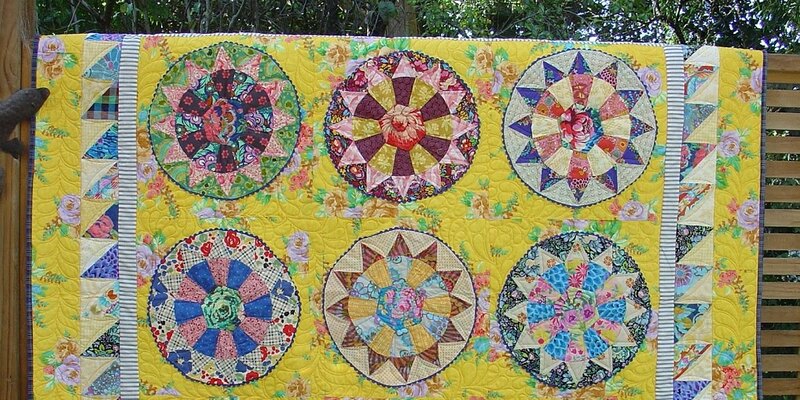 Luckily I came across this - a "Classic meets Modern" quilt-along!!! Each month Erin @ http://www.sewathomemummy.com/2013/12/the-classic-meets-modern-qal-at-sew-at.html shares a classic block, and adds her modern slant on it. It really caught my eye! And, while baling from the previous BOM/ 40 Shades of Grey, I did find having a monthly deadline to work towards was a great incentive. So now I've been busy catching up 'cos, of course, the QAL began back in January! So far, we have done 1/2 square triangles, Y seams, and curved piecing. It's been interesting for me to revisit some of these techniques. They are blocks I have made earlier over the years, a real classic sampler quilt, but right now I am focusing on change! .......can I make the blocks just a wee bit more modern ? .......just in some small way? Well quilty friends, what do you think? it's the "journey" isn't it?....yeah right!! It began as a vague idea.... I'd seen a photo somewhere of a block that appealed to me, vintage-y & scrapp-y. So still not too sure about the actual pattern I was going to use, I started sorting out a few fabrics. I wanted to see if I had enough in my stash to get the right feel. I began to search a bit more selectively, a bit deeper into the baskets, thru' some of my more older fabrics for small scale, faded fabrics, with no set colour scheme in mind. I looked at this group of fabrics for several days, adding to it & pulling out the odd one. Then the other day I had a little play drawing up a template. I wanted a large circle, a Dresden Plate maybe, but how many segments? I finally decided on 16 wedges, and understood that I needed to make a circle, which is 360 degrees, easy! But maths is not my strongest point! Needed mr D's input here!! I did a test block with 16 wedges, just to check that mr D. had indeed done his maths right! H-m-m-m- it wasn't going together so well...see the humps? It was a bit better, but still not right. We got out the graph paper again & suddenly mr D. shouted "no, no, no" and quickly got to work drawing up a brand new template for me. We had the tools, just needed to concentrate a bit more!!! I must confess - it was a bit of work for both of us, and quite a bit of unpicking for me!!! It'll all go together in the end!!! I can't waste the earlier fabrics - they are so perfect for this! - I'm sure I can be a bit creative in making them fit! And then, a few days later, guess what? "Adding Layers" by Kathy Doughty/ Material Obsession. And there inside was the perfect pattern, and the template for 20 wedges, and some excellent advice re fabric choices. Pattern, template & advice - all the hard work already done for me right there in black & white, & colour !! http://www.stitchedincolor.com/2014/02/what-makes-it-vintage.html where Rachel shares her thoughts on what makes a quilt look vintage. Still. I'm glad we went thru' the processes. It's all fun ........ teamwork, choosing the fabrics, working out the maths, rethinking when you find you don't have enough of one particular fabric, revisiting the starting point, etc!! I did find that cutting & sewing really did need to be v. accurate! A consistant 1/4" seam essential! And a plastic template would have definitely helped! Now I need to clock up some sewing miles! And, mr D. really did enjoy coming along this journey with me too!!! P.S. and for a bit of light relief after all that, and it was such a wet weekend here in Auckland, I made a Drunkard's Path block! Linking up with "Classic meets Modern" QAL and WIP Wednesday later in the week. Off now to do some baking for Olive's 3rd Birthday party tomorrow! Just taking a break from my Broken Glass blocks today because I'm a bit overdue with a gift! A friend of the family had a wee baby boy a couple of weeks ago & what does every newborn need? a little quilt of course! I like to have a couple of small quilts here in the " almost finished" pile, just needing the quilting done and/or binding put on. She had popped in to visit a few weeks before baby came & picked out a quilt she liked, one I made ages ago & was almost, almost finished!! So today I've sewn on the binding & will sit tonight & handsew the back of it down. And remember these scarves ? Well one easter rabbit has been made & went straight away to it's new home! I had an "Olive" day yesterday & we set about making a rabbit together! Olive chose the red scarf...lovely! I sewed & she stuffed!! (you can imagine the mess....small bits of white pillow stuffing all around the sewing room!!!) But we had a lot of fun & I just managed to get a pic before she & rabbit went home! Linking up with Lee @ WIP Wednesday later on today. I do like having a "work- in- progress" on the go. And thanks to the fresh scrappy low volume input from fellow quilters, I've been busy working steadily away at my Broken Glass quilt. I find that by cutting blunt points on the triangle tips eliminates those "ears" and certainly helps when joining all the triangles together. I have also found it easier if I do four at a time, and the pile of blocks is growing quite quickly now! I am not enjoying making the blocks at all, lots of reasons why, and really don't want to make any more! So I have spent the last couple of weeks wondering which way to go with them. After playing with them for ages today trying to work out some way to get them to gel together, and not succeeding, I had a "lightbulb moment" !!! I have now decided that I will make all the nine blocks up to the same size. 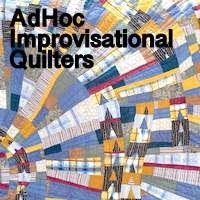 Then layer them up, do some quilting, and send them off to Alison, Little Island Quilts. She is asking for "quilt-as-you-go" blocks which she is assembling together into quilts to send to street children living in Mexico City. Last "work-in-progress" is the ﻿Slab Sewing -take 2 .... just to finish up today I quickly made another block for our Monday Modern group monthly Block Lotto. This one went alot easier after studying what others had done!! Check out more here @ our flickr pool. I think the trick is not to start with your white square anywhere near the middle! .....yep I'm alot happier with this one! At our Monday Modern group this week a few of us did a little scrappy fabric swap. I came away with more low volume black & whites so I was v. happy...they will add some much needed variety to my scrappy Broken Glass quilt, and that's really great! I have been busy today sewing a few more blocks, will do pics next time. We also have our next challenge! Louise handed out assorted scarves and challenged us all to make something for easter ...soft toy bunny/easter eggs/baskets, etc.....they could/will end up very colourful and cheerful !! I chose to work with purple, as it's not a colour I have used alot! I found myself automatically going along a sort- of- log cabin assembling style, which I don't think is the real idea! I had to work really hard to make the starting white square NOT in the centre!! Didn't really succeed thou'. I also found my corners got a bit chewed up as I did the recommended quick zigzag around the outside edge of the block. Still, I'll make another one, or ten ...it's kind of addictive & fun !!! So a few "works in progress" right now as you can see! Linking up with Lee @ WIP Wednesday. Not too long ago Alison, @ Little Island Quilts, posted a request for help. She is asking for "quilt-as-you-go" blocks which she is assembling together into quilts to send to street children living in Mexico City. Have you heard about this? You can read more here and here. I found four lone blocks I had made a while back - you know, with the intent of making a quilt, but somehow I must have got sidetracked !! I checked the sizes of my blocks and these varied considerably! I think I had made the centre squares all different sizes too! Anyway this afternoon, I sewed a couple more rows onto the blocks that didn't measure up to the required 12 1/2". And then layered them up & quilted each one with a simple 1/4" outline. These four blocks do kind of look v. soft & girly ....... hope still ok for the cause? ...just need the wine & the cheese!! And, I received a little package in the post today...I know I know...do I need any extra fabric just now? These fabrics are from Amitie Textiles/Australia, a monthly stash pack, 10" squares of pretty! And, my goodness, do they ever look & feel v. different! Why can't we get this sort of fabric over here in good old NZ I wonder?